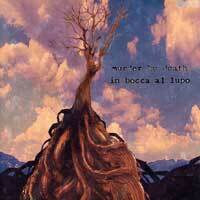 Indiana's Murder By Death layer the vocal sounds of an old saloon with the haunting strings of a Hungarian folk dance and the hard driving rhythms of pure rock 'n' roll, producing lush, orchestrated songs somehow simultaneously reminiscent of Johnny Cash and Radiohead. Added to that thick and intriguing sound are a series of dark and ironic lyrics, combining the mood and tone of Nick Cave And The Bad Seeds with the narrative force of The Decemberists or a short story by Nathanial Hawthorne. This record examines themes of sin, transgression, punishment, and redemption, touching on different lives and different stories in each song. This album hasn't stuck with me as quick as their last release.It has influenced me to read Dante's "The Divine Comedy" which includes the story of "The Inferno. "It's interesting seeing the similarities in the book and this album.The atmosphere in the music gives me the same feeling as the book.As for the music itself,it's a lot more "rock" than there last release.I can't compare this with their last release because they're two completed different concept albums,both require different types of songwriting.If you're a fan of this band,I'd say pick it up.If you're new to this band,pick up "Who Will Survive,And What Will Be Left Of Them. "I'm giving this a five because it's trully a good album and I'm sure it'll grow on me more in the future.